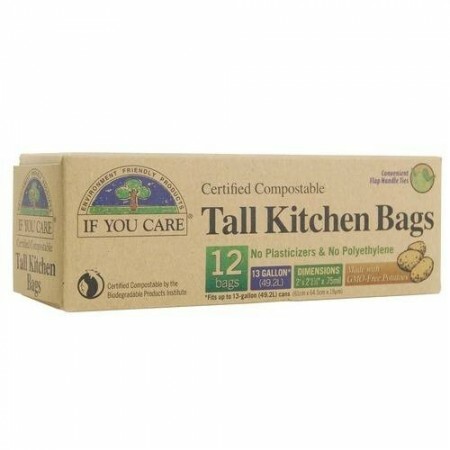 If You Care certifed compostable kitchen waste bags are made from GMO-free potato starch. Completely free of polyethelyne and plasticisers. Convenient flap handle ties. Box of 12 x 49L bags packaged in a recycled chlorine-free box. 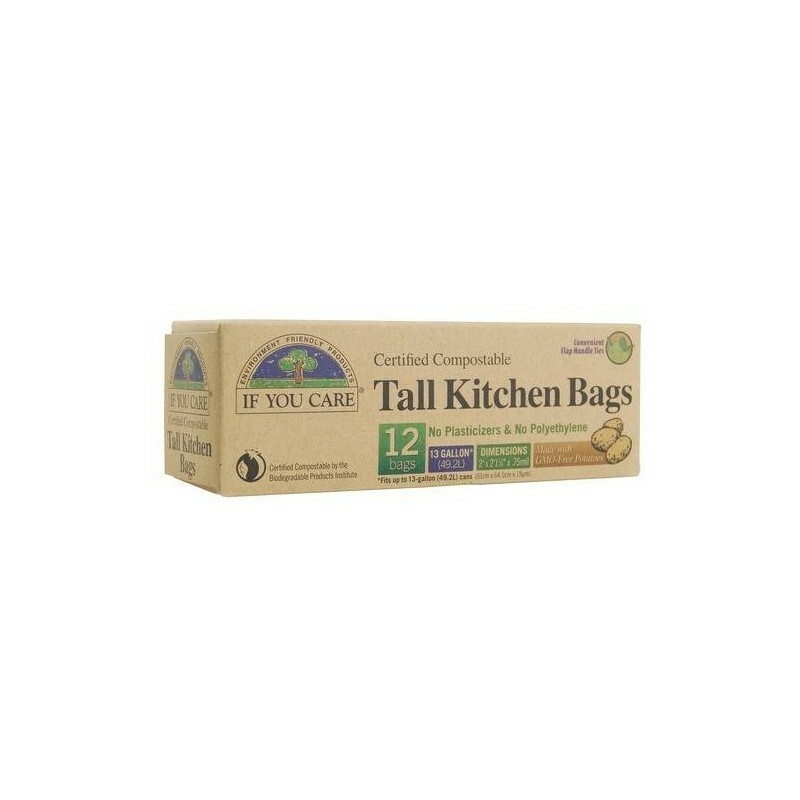 If You Care certifed compostable kitchen waste bags are made from GMO-free potato starch. They are completely free of polyethelyne and plasticisers, instead are made with a biodegradable/compostable polymer. Potato starch from potatoes grown purely for their starch - no diversion from food supplies. Potato starch requires less water & 40% less land to produce than corn. No irrigation is used, only natural rainfall. Using a compostable alternative to plastic reduces pollution and landfill. Produced from non genetically modified potato starch, a more sustainable alternative to corn. Certified compostable and biodegradable (including polymer). Suitable for commercial composting bins or home composters. No plasticisers and no polyethylene. Recycled chlorine-free cardboard packaging that can be recycled again. Store bags in a cool, dry place away from direct sunlight. Each bag measures 61cm x 64.5cm x 19cm. 49.2 litre capacity. The eco credentials of this product are very good. HOWEVER, as soon as these bin liners come into contact with anything damp, they start to break down. Many times, I have pulled the bag out of the bin tray and a whole mess ensues! Crap everywhere! I am switching to other brands of compostable bin liners. I have had to tell my housemates not to fill the bin as much as we normally do, as these bags tear as you lift them out of the bin. But, they are so much better for the environment that I will continue to use them. It is a small price to pay, really. I guess it depends what we put in them but sometimes they are great, and other times they break. If you put anything wet in there e.g. tea bags they tend not to last as long. We are buying another pack though, so on average they are ok.